The college started its academic journey in the year 1998 with 6 branches of study, that included both UG and PG streams. The Excellency began this initiative is Col. Prof. Dr. Vel. R. Rangarajan, a visionary and philanthropist by nature. Our college is affiliated to University of Madras. 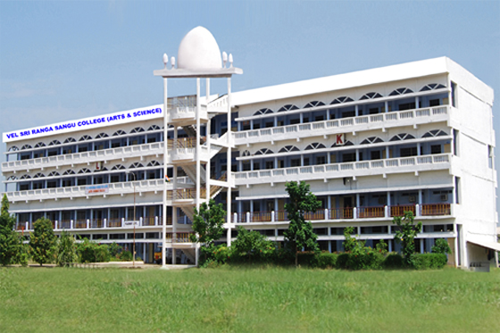 This college runs under R.S Trust. Our college is one among the renowned educational institutions which caters holistic education to the students of various strata of the society, particularly to the students with poor economic background. The college is manned by highly qualified and dedicated faculty who always strive for the betterment and welfare of the students. Our college periodically organizes various events, such as Seminars, Workshops and Guest Lectures to equip our students with latest and recent trends that are evolving in their respective domain. Moreover, we have MOU with various industries, academic and trade bodies in order to arm our students with practical exposure. Our college is equipped with excellent infrastructure, which includes lab facilities, library and other amenities which provides platform for our students to learn in a amicable and stressless manner. Our college has been rendering yeoman service in the higher education arena. It contributed able Administrates, Academicians, Professionals, Scientists, Intellectuals, Social activists, Entrepreneurs and other personalities to the society. This act as a testimony to the social responsibility of the college. Let us make India strong as never before. Future of India is in your hands!. Implies that we should inculcate the supreme virtues of life such as Honesty, Integrity, Charity, Hard work, Politeness of behavior and purity of soul. Denotes that we must venture out with confidence into new fields of knowledge and experience and extend the horizons of our achievements to the uttermost bounds following the words of the poet Tennyson.